More than 180 people attended at the AGM of Sydney’s Hakoah Club despite there being no election and were “walked through” the Hakoah proposal for the redevelopment plans of the White City site. 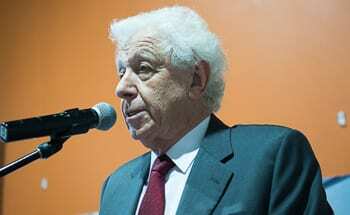 Another surprise in store for the members was to be addressed by Frank Lowy, the head of Westfield and Life Patron and Governor of the club he presided over between 1969 and 1988. He recently told members in a letter that the club had been part of his life since arriving in Australian in the 1950s. The club itself was founded in 1939. Lowy had brokered a solution between the incumbent board and a rival group which had had other plans for the massive site. The group agreed to withdraw nominations for the current board at the AGM and to cancel a planned EGM as well as dropping legal proceedings. Lowy has given the incumbent board to the end of the year to produce a DA for the site which would have the likelihood of gaining the approval of Woollahra Council. 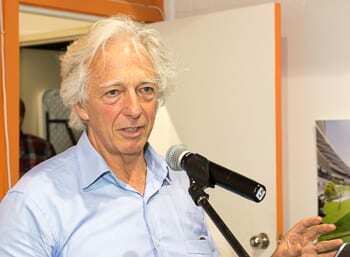 Lowy explained that the two groups had different plans regarding the size of the soccer field and now that the second group had withdrawn “the controversy is gone and everyone is in favour of resolving this difference of opinion between the two groups”. He said that it was never going to be easy to get the development plans through or to find the funding but the site is “irreplaceable and can never be found again”. He warned the current board members about the difficulties they would encounter but said that he and his son Steven are “here to assist them” and he hoped they would succeed “to make the project a reality”. Club president George Farkas told the meeting that Hakoah established its football club in 1939 and its social club five years later with sporting activities encompassing soccer, tennis, table tennis and cricket. The president detailed the club’s history as it grew and its support of community organisations in providing free facilities with a special emphasis on Maccabi. Farkas said that the provision of sporting and cultural facilities would enrich the lives of the community…especially its youth. He said that there had been many obstacles to overcome to get to the point at which the club is at now. Farkas reported that the board is now in a position to lodge a development application once a new DCP had been obtained. Farkas spoke about the heritage issues stating that a heritage listing of the whole site “had the potential” of preventing their current plans reaching fruition. He said that Woollahra Council had agreed that the White City Gates, certain trusses and certain arches were to be considered heritage. Farkas told the meeting that since the alternative proposal for the site had included selling off 25% of the land, one Woollahra councillor was canvassing the others to apply a heritage listing to the entire site. He said he would be dealing with this problem this week. Farkas said that Hakoah was now at a critical turning point with regard to its future. Farkas then listed the facilities planned for the future Hakoah Club: Hakoah Club lounge bar, bistro restaurant, indoor/outdoor cafe, function centre, communal offices indoor aquatic centre with a 25m lap pool and a learn to swim pool, multi-purpose indoor sports complex for Maccabi, full-size football field, gymnasium, wellness centre, childcare centre, a children’s playground and additional tennis courts for Maccabi. The development is planned to take place in stages. Stage one has three components. A: The football field, the grandstand and the indoor cafe. B: The first two levels of the club building including the childcare centre, the gymnasium and the Hakoah Club bar and bistro restaurant. C: the outdoor 25m lap pool with a barbecue and lounge chair area and outdoor basketball court. He said that the projected cost would be between $6 million up to $20 million with money obtained through funding, memberships and the sale of poker machine entitlements. Farkas paid tribute to Frank Lowy who had been the club’s president from 1969 to 1988. 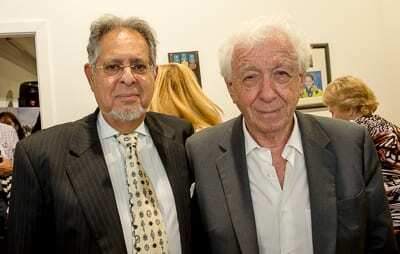 George Farkas told Hakoah members that Frank Lowy had accompanied the board throughout its long White City journey. adding that Lowy’s letter to members had “galvanised the community as I had never seen before”. He said that Lowy’s letter had been a turning point which helped “realise the dream”. Farkas also praised the efforts made by Steven Lowy and announced that as a result of the family’s involvement others had now “come on board”. Welcoming new board members Michelle Myer and Simon Wilkenfeld, George Farkas said: “This project is on a trajectory to success”. Architect Michael Mandl went through the project showing how many of the facilities would be multi-functional. 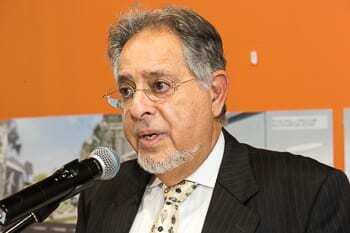 George Farkas responded: “We have always dealt properly with Woollahra Council. The Council and Hakoah are in total agreement as to what should be retained at White City.” The president said that the councillor concerned about the heritage being applied to the whole site was due to the reported proposal to sell off part of the land.” The Board’s proposal retains the entire site.He agreed that the DCP had to be changed and that is exactly what the Board had been negotiating. J-Wire spoke to Alan Coker head of Planning at Woollahra Council. He told J-Wire: “We received a Gateway determination from the Department of Planning and Environment covering the three items listed. “They did that…but it was subject to a condition that we get an independent heritage to support the council’s position We went to four or five heritage consultants and not one of those consultants could support the council’s position.” He said that there was criticism of the brief that the Council had issued and that the Council asked the mayor to review the brief and to reissue it as there may have been “differences of interpretation”. He said that he consulted with the Department of planning and it became evident that they wanted “a broader brief than the one that was issued”. He said theat it was likely “that the brief will be reissued this week”. 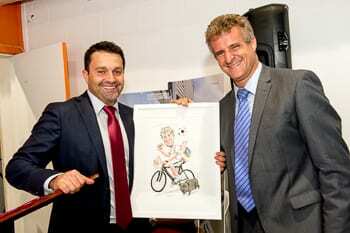 A presentation of caricature was made to Michael Evans who retired from the board after nine years’ maximum service. I was at the meeting and was flabbergasted to hear that Carl Reid had been to the Council – as you have reported – and had approached unnamed people there without the approval of the Hakoah Board. I was very surprised and disappointed that he made these public and potentially damaging statements – now reported by you – which he knew would almost certainly be reported by the media that had only been allowed to attend the meeting with the approval of the members present. He said he did not intend to speak – yet he did. What changed his mind? Now that you have reported what happened – which you obviously are entitled to do – I intend to say what I thought should best remain unsaid after Carl Reid made his remarks. Far from agreeing to an amicable resolution of the dispute it now seems to me that the insurgents are going out of their way to torpedo the Board’s DA. That is highly damaging to the interests of the Club and its members. I hope that Carl Reid can allay my fears that this is not so. Carl Reid now needs to explain why he went to the Council without the Board’s approval and why he decided to publicly raise the issues with the media present – rather than with the President privately. Could he not have approached the President before the meeting and raised his concerns in private? If not satisfied with the President’s response – then go public if he wanted to – although I believe this would have still been the wrong thing to do. Apparently the insurgents fail to realise that if the Board’s DA fails then the insurgent’s plan hasn’t got a chance in hell of succeeding since it is based on selling 25% of the site. So why not get behind the Board’s DA and let the Board and its highly experienced and expert team of consultants deal with the heritage issues? Carl Reid also told the previous AGM that the Board’s proposed plans had no chance of receiving approval. He also told last year’s meeting he had resigned as the Club’s Solicitor at 5pm on the same day as that AGM was held just some few hours later. Such gratuitous advice from the Club’s former legal adviser at two successive AGM’s is very disappointing to say the least.